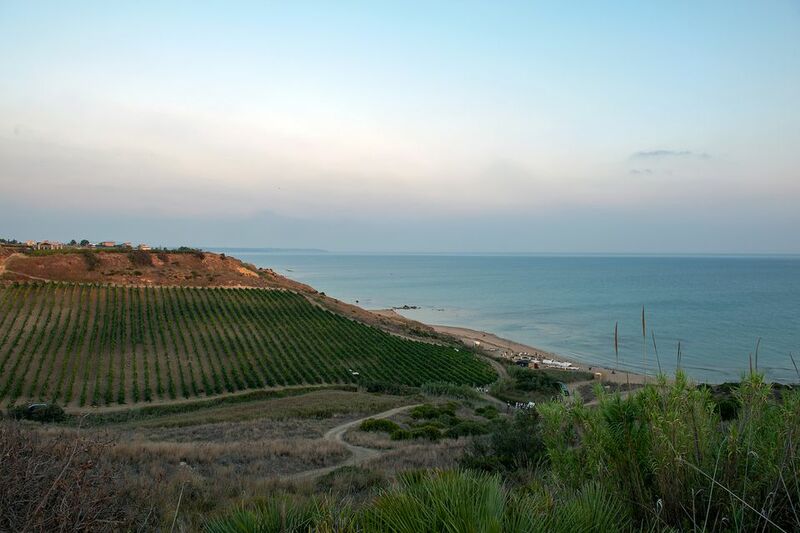 If you envision the island of Sicily — the largest in the Mediterranean Sea — as a triangle, then understanding the characteristics of this southernmost italian landscape will be easier, especially when learning about the special wines that grow here. For over 2500 years, this place has held viniculture and winemaking as central tenants to commerce and culture. But as expected in a timeline so vast and wide, there have been a lot of changes over that course in history. In the beginning, every group that came and went — conquered and fled, leaving influences on the tapestry of a culture — made wine as well. Sicilian wine was even featured in Homer’s Odyssey, when the cyclops gets drunk on it. Ultimately, the consistently sunny climate, reliably low rainfall and drying wind makes Sicily ideal for agriculture. Thus, grapes were always growing here, along with many other crops that still thrive today, like nut trees, olives and citrus. Part of the benefit of having climatic consistency ironically brought about some hardship for Sicily as a wine region. The temptation to over-produce wine, without much attention to quality, in addition to government subsidies supporting higher yields, led to an abundance of mass produced, low quality and cheap wine. In turn, consumers started associating Sicily with this poor quality wine, and sales began to plummet. Fortunately, some pioneers began to turn the tide on this trend in the 80’s and 90’s, which has resulted in a change in reputation. Today, wine industry professionals are looking to Sicily as holding a huge amount of capacity for producing interesting, unique and elegant wine. Sicily's northeastern tip is where Mount Etna sits, and is thus known at the Etna Denominazione di Origine Controllata (DOC). This is the collective trademark for the protection, definition and classification of quality wines in Italy, with each DOC being subject to strict regulation by the government. This is Mama Mount Etna, as referred to by anyone who lives here, with as much reverence, fear, love and emotion that any other all-powerful mother holds on her children. The volcano has and continues to be active since as early as 425 BC, with historic eruptions that have completely destroyed entire towns. But that mineral-rich volcanic soil is amazing for grapes, and can impart graceful, complex and place-driven characteristics if put in the hands of talented winemakers who respect the volcanic environment. This region is best known for Carricante and Nerello Mascalese grape varieties, both of which are indigenous to the area. With a spectacular tasting room about to open in a couple months, family-owned Pietradolce in the town of Castiglione embodies a winemaking philosophy that holds true for many Mount Etna vineyards, centering on great pride and reverence for their unique locale. They only cultivate native grape varieties like Carricante and Nerello Mascalese because they are the most suited for the local volcanic conditions. From the driveway leading up to Pietradolce, the new, monumental facility gives off an extremely contemporary impression. In a very different direction from Pietradolce, down on the Southeastern end of the Mount Etna region close to Catania, is Barone di Villagrande. Located in the town of Milo, the wines made here have the unique position to receive much more rainfall than the rest of the entire island of Sicily, making it especially suited for white varieties — specifically the native carricante. Barone di Villagrande was established in 1727 and is now in its 10th generation of family ownership. But the young descendants currently at the helm are anything but tied to tradition. They bring a vibrance to the place almost as impressive as their delicious wine. After a day of tasting, book a night or two in one of the four “wine resort” rooms on the property, complete with a vineyard view infinity pool and farm to table restaurant. Down at the bottom tip of the triangle is the Southern coastal slopes that move from east to west, with lower elevations than the Etna mountainsides above. Here are the DOCs of Siracusa, Noto, Eloro and Vittoria, and the region that holds the Cerasuolo di Vittoria DOCG — the only place to get the highest level of certification indicated by the additional “G”, meaning guaranteed (“garantita”). Cerasuolo means “cherry-like”, and wines from here strive to meet that association. The weighty Nero d’Avola grapes that Sicily is known for and the light-bodied, floral and delicate Frappato grapes make up wines from this region, which is quite large at about 45 miles wide. A producer worth seeking out from this DOCG is COS, known for organic and “natural” wines with very little oak. Winemaker, Arianna Occhipinti, makes a version of the Cerasuolo blend called Pithos Rosso, which is fermented in clay amphorae. Moving up along the Western left-hand edge of the triangle is the large Marsala region, which got a bad rap when folks were tinkering with the wine known as Marsala “speciale”, adding flavors like amaretto, coffee or berry. Marsala winemakers are striving to shed that association and many traditional fortified wines from here are worth noting. Perhaps the most famous producer is Marco De Bartoli winery. This regional legend has a lot of acclaim and several selections made from the local Grillo grape that are worth searching for (but not cheap!). There are many more DOCs in this Northern area, including the Monreal region which sits closest to the island's main city of Palermo (which is one of the younger DOCs beginning in 2000) and the Alcamo region — both areas have a diverse range of varieties being produced. Syrah, a very international variety, is showing great potential here, and one producer that makes a lovely one is Alessandro di Camporeale, an organic, multi-generational estate that also produces wonderful olive oil from their ancient olive grove. And then there are some bonus spots that grow amazing wine grapes that are not even in the triangle, but on tiny islands separate from Sicily. The Aeolian Islands, off the northeastern coast of Sicily, is covered under the Salina IGT (Indicazione Geografica Tipica). This region is best known for the fragrant and lush Malvasia grape variety, especially on the island of Lipari, the largest of the eight Aeolian islands. Good wines to try from the Salina IGT include the Regaleali brand, which includes Tenuta Capofaro and Tasca d’Almerita. Pantelleria, an island so far down below Sicily that it is practically in Tunisia, is a rough island. It's hard and intensely windy, but so good for growing Zibibbo (also known as Muscat), which they turn into excellent sweet wine from the dried grapes. If you journey this far, definitely stay at the luxe boutique hotel Sikelia in partnership with Costa Ghirlanda vineyard. If you are lucky, you’ll get to sip on some of the astounding Silencio.